NBC 6 South Florida reports that Swire Properties has donated forty trees from their Brickell CitiCentre site to the future Pérez Art Museum Miami site. 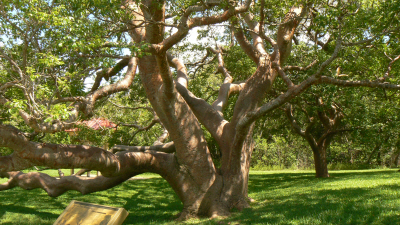 The trees, including historic oaks, gumbo limbos and strangler figs, range from 25 to 150 years old. Arborist Lisa Hammer is overseeing the excavation and the loading the giant trees onto a barge to transport them through the Miami River to the future location of the museum. Hammer determined the best ways to excavate the trees without causing them harm or shock, Swire Properties said. “I was responsible for making sure the trees had enough water, no symptoms of stress, and giving the trees treatments that were deemed necessary, such as fertilizer,” said Hammer, who has been practicing for 25 years and has a master’s degree from Florida International University. She will continue to monitor the maintenance of the trees for one year.